Outline: This tutorial is about how to make your Video_TS folder playable on Mac via QuickTime. QuickTime is the built-in media player on most Apple devices, you can watch TV shows, HD movies on Mac via QuickTime player. QuickTime supports these videos formats such as QuickTime Movie (.mov), MPEG-4(.mp4, .m4v), MPEG-2 (OS X Lion or later), MPEG-1, 3GPP, 3GPP2, AVCHD (OS X Mountain Lion or later), AVI (Motion JPEG only), DV, ect. Apparently, Video_TS folder is not supported by QuickTime player, which is actually a DVD folder mainly contains VIDEO_TS.IFO, VIDEO_TS.BUP, and VIDEO_TS.VOB. files. If you want to play your Video_TS file on Mac via QuickTime player, you'd better convert the Video_TS folder to QuickTime compatible format like QuickTime MOV. To convert Video_TS files to QuickTime MOV, a professional Video Converter is needed. 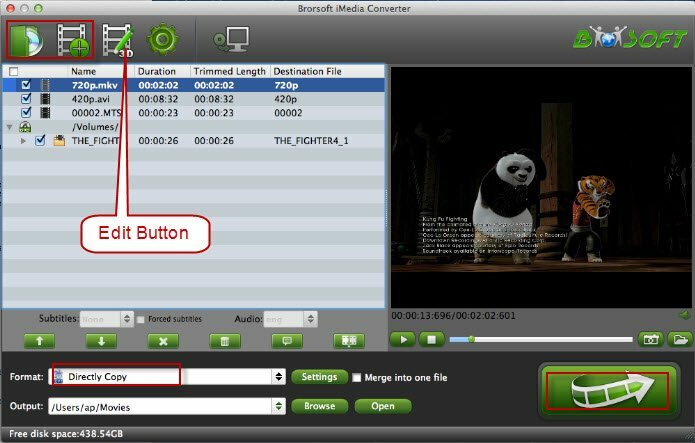 Brorsoft Video Converter Ultimate/ (iMedia Converter for Mac) is your right choice . With it you can convert VIDEO_TS folder as well as DVD/Blu-ray disc, DVD ISO/IFO files to QuickTime MOV in a decent video quality. Besides, the program also has a built-in video editor allows you to trim, crop, add watermarks to get the right videos you want. Now download the free trial program and start the conversion. Here we take Mac Version Brorsoft iMedia Converter as example, Windows share the same steps, just keep in mind you have download the right version, Mac platform .exe files cannot be installed on Windows OS – and vice versa. How to rip and convert Video_TS to QuickTime MOV on Mac? The loaded files will be displayed on the left source windows. Click Format and then choose MOV as target format. This software offers the QuickTime Movie Format for Mac. Or, you can also choose "Common Video -> MOV - QuickTime (*.mov)" as the output format. Tip: If you like, click "Edit" button to Trim, Crop, Add Watermarks to get what you want. In this way, you can not only personalize the video, but also reduce the output file size. With all settings, click the "Convert" button to convert Video_TS to QuickTime MOV videos. The conversion speed depends on the original video size. When the conversion completed, tap "Open" file to locate the converted files. Now you can play the converted Vedio_TS files on Mac via QuickTime player without any hassle.